As we turn the calendar to 2018, we took a moment to look back at the past year to see what were the most popular articles in our Housing Perspectives blog. When Do Renters Behave Like Homeowners? Are Home Prices Really Above Their Pre-Recession Peak? What Would it Take to Make Neighborhoods More Equitable and Integrated? Household Neighborhood Decisionmaking and Segregation, an overview paper co-authored by Justin Steil, the panel’s moderator, and Reed Jordan, investigates what we know about households’ decisionmaking processes and explores the ways that technology and other interventions might help create more integrated places. They note that notwithstanding the significance of schools and other local amenities, the racial composition of a neighborhood is a significant determinant in the residential decisionmaking process. Moreover, they add, while homeseekers increasingly rely on the internet, it is not yet clear how that reliance impacts the makeup of neighborhoods. However, they note, it seems clear that different sources of information have implications for segregation and may serve as points of leverage for pro-integration interventions. Data Democratization and Spatial Heterogeneity in the Housing Market, by Ralph McLaughlin and Cheryl Young, argues that improved access to residential real estate data has the potential to affect residential settlement patterns in two countervailing ways. On the one hand, it could expand individuals’ housing search choice to include properties in more diverse neighborhoods. Alternatively, it could increase the demand to live in amenity-rich locations, which might price out existing and future residents (unless the supply of housing in those locations grew at a similar rate). However, they argue, the extent to which households might be priced out of a neighborhood is not primarily influenced by data availability but rather by the ease with which housing supply can be increased to meet demand in those areas. They therefore recommend three policy approaches: reducing exclusionary and restrictive zoning policies in expensive, amenity-laden markets; giving housing choice voucher (HCV) recipients the option to conceal their voucher status from landlords during the application process; and requiring that some available Low Income Housing Tax Credit funds be used in “high-value” Census tracts. Minority Banks, Homeownership, and Prospects for New York City's Multi-Racial Immigrant Neighborhoods, by Tarry Hum, focuses on the role of Asian minority banks in in lending to Asian borrowers for residential property purchases in Queens and Brooklyn. Established to counter financial exclusion resulting from discrimination and linguistic and cultural barriers, these banks historically have been a key source of credit, especially for Asian immigrants who may not qualify for conventional loans. However, using data sets from 2010 and 2015, Hum shows that there was a significant rise in lending by these banks to investors rather than owner-occupants. She concludes by exploring how these changes may be driving up prices, displacing low- and moderate income renters, and spurring illegal conversions – changes that together may be destabilizing many of the neighborhoods where the loans are being made. The three papers build on previously released papers from the symposium that discuss the nature of residential segregation in the US, its consequences, rationales for public policies to address those consequences, and priorities for action. Over the next several months, the Joint Center will be releasing additional papers from the symposium that will focus on promising strategies in a variety of areas that would help foster more inclusive residential communities. The papers also will be collected into an edited volume that will be published in 2018. Additional papers from the A Shared Future symposium are available on the JCHS website. A decade of unprecedented growth in the rental housing market may be coming to an end, according to our 2017 America’s Rental Housing report, being released today. Fewer new renter households are being formed, rental vacancy rates have risen, and rent increases have slowed. At the same time, renter demographics are changing and nearly 21 million households continue to pay more than 30 percent of their income for rent. This year’s report paints a complicated picture of the rental market. We’re finally seeing the record growth in renters slow down, but while the market has responded to rental housing needs for higher-income households, there are alarming trends that suggest a growing inability to supply housing that is affordable for middle- and working-class renters, let alone those with very low incomes. Addressing these challenges will require bold leadership and hard choices from both the public and private sector. SIGNS OF A SLOWDOWN. Overall, rents increased more slowly in most markets across the country. Starts of new multifamily units reached a plateau in 2016 and have now fallen by about 9 percent through October 2017. THE CHANGING NATURE OF RENTERS. While renters are disproportionately younger and lower-income, growing shares of renters are older and higher-income. For example, the number of renter households earning more than $100,000 per year increased from 3.3 million in 2006 to 6.1 million in 2016. THE CHANGING NATURE OF NEW RENTAL UNITS. Additions to the rental stock are increasingly concentrated at the high end of the market. The share of new units renting for $1,500 or more (in real terms) soared from 15 percent in 2001 to 40 percent in 2016. Additionally, the share of new units renting for less than $850 per month fell from 42 percent of the rental stock to 18 percent. The challenges to building low- and moderate-cost units are most severe in metros like San Jose, San Francisco, Honolulu, and Washington, D.C., where more than 50 percent of all rental units rent for over $1,500 a month. AFFORDABILITY CONTINUES TO BE A MAJOR PROBLEM. Despite rising incomes, nearly half (47 percent) of all renter households (21 million) are cost burdened—meaning they pay more than 30 percent of their income for housing, including 11 million households paying more than 50 percent of their income for housing. While these figures are down slightly from recent years, the number and share of cost-burdened renters is much higher than it was in 2001, when 41 percent (15 million) were cost burdened. Burdens are particularly high in Miami, Los Angeles, New Orleans, and San Diego, where 55 percent or more of renters are cost burdened. AVAILABILITY OF RENTAL ASSISTANCE HAS SHRUNK. Even as low-cost housing units are disappearing, rental assistance is becoming harder to access for very-low-income households. The share of very-low-income households who receive rental assistance declined from 28 percent in 2001 to 25 percent in 2015. Addressing these challenges—particularly expanding the availability of low- and moderate-cost housing options—will require that all levels of government ensure that the regulatory environment does not stifle innovation, and that tax policy and public spending support the efficient provision of moderately-priced housing. You can view the full report and interactive metro-level tools here. 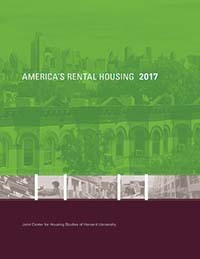 The release event for America’s Rental Housing 2017, being held today at the Newseum in Washington, DC, will be webcast live from 1:00 – 3:00 p.m. The event will feature keynotes by Senator Maria Cantwell (D-WA) and Pamela Hughes Patenaude, Deputy Secretary, U.S. Department of Housing and Urban Development, as well as a panel discussion moderated by Laura Kusisto, housing reporter for the Wall Street Journal. For the full agenda or to watch the livestream, visit www.jchs.harvard.edu. Asking "what would it take"—about housing segregation or any other challenge— assumes, on some level, that we have adequate agreement that some condition or pattern is, in fact, a problem. But in America, we have never been able to take that for granted, not about most of our big challenges, not even about the things that strike many of us as profoundly inconsistent with fairness and equal opportunity as core American values. Moreover, we have shown a persistent and very particular indecision and impasse when it comes to acting on housing segregation. The political Left remains ambivalent about it, wondering whether it is urgent to address segregation per se, whether such effort comes at a cost to other urgent efforts, and whether segregation can be tackled in ways that do not stigmatize poor people of color in particular. Put another way, the seemingly natural allies for an agenda to tackle inequality by addressing segregation have mixed feelings about both the problem and at least some of the solutions. The political Right, on the other hand, has been generally hostile to the idea that segregation is a problem, even if most Americans, on both Left and Right, agree that discrimination in the housing market is not only illegal but morally wrong. And many who go further—who agree that segregation itself is a problem—are less convinced that it warrants government intervention. These are some of the reasons that we, as a country, "rediscover" segregation and its enormous human costs every decade or so, only to conclude that it is too intractable or questionable to tackle with serious resolve. This rediscovering happened after the civil unrest in Los Angeles in 1992, again after Hurricane Katrina put concentrated black poverty and public outrage squarely on TV screens nationwide, and again as political and media attention to extreme inequality has gown in recent years. Among scholars and opinion leaders, the influential work of economist Raj Chetty and collaborators points to segregation as a key barrier to economic mobility in America—and one that varies sharply between more and less segregated regions of the country. This latest-generation work supports earlier conclusions, by sociologists Douglas S. Massey and Nancy A. Denton in American Apartheid: Segregation and the Making of the Underclass and by others, that housing segregation by race and income is, in fact, one of the lynchpins of American inequality. Along with mass incarceration, it is one of the structural patterns that differentiates America from other wealthy nations (though Europe faces growing challenges too). Segregated housing patterns are durable and enduring in part because they are sustained by forces that many view as legitimate and even unavoidable, if unfortunate. These patterns have been called out explicitly at least since lawyer and planning professor Charles Abrams's book, Forbidden Neighbors: A Study of Prejudice in Housing, and by national policymakers since the landmark Kerner Commission report on the riots that tore apart American cities 50 years ago. For now, there are no signs that we as a people are serious about changing segregation. In this brief post, I'd like to offer a specific reading of the very thoughtful symposium framing paper and the larger project of which it is a part. I work at a grant-making foundation long committed to expanding knowledge about, and promoting solutions to, inequality, including solutions that center on housing and specifically housing segregation. I have also pursued these aims over several stints in federal government service and tackled them as a community planner at the local level. Finally, about sixteen years ago, when I was a researcher and educator, I organized a symposium and collection of papers—led by the Harvard Civil Rights Project and cosponsored by the Joint Center for Housing Studies and the Brookings Institution's Metropolitan Policy Program—focused on segregation, its causes and consequences, and "what it would take" to effect real change at scale. That produced an edited volume, The Geography of Opportunity: Race and Housing Choice in Metropolitan America. I want to briefly look back—asking what has or has not changed in our understanding of the problems and potential solutions over the past decade plus—and also look forward. The 2001 symposium had several points of departure, and revisiting them now offers some perspective on how our national mood, key attention-getting trends, political leadership, and more have evolved. One starting point was the sharply increased attention, in the late 1990s, to America's dominant pattern of urban sprawl and the idea of pursuing more sustainable or "smart" growth alternatives. The interest in this issue sparked healthy debate, though mainly among scholars, planners and allied professionals, about the tradeoffs between environmental aims and values of equity, including housing affordability. The environmental justice movement also drew attention to spatial inequality, focusing on the highly disproportionate exposure of poor communities of color to toxins and other environmental risks. Other starting points were even more tectonic, driven by large-scale demographic change. Much of the wealthy world has modest to zero population growth, but America is different: We are a large and still-growing nation, thanks mainly to immigration, which is, in turn, driving greater racial and ethnic diversity. In the 1990s, for example, the population of most American cities would have shrunk if not for immigration. What is more, as of the 2000 census, an estimated one-third of the built environment needed to accommodate population growth in America over the next generation did not yet exist. It represented projected new development. This underscored the huge stakes associated with how we grow, particularly the prospects for inclusionary growth. It also underlined the fact that our debates about persistent segregation cannot be limited to public housing in inner cities or to other long-established fixtures of our current spatial footprint. We always need to be asking about what's next too—about the course of new development, both infill and at the edges of urban regions. And of course, we need to pay attention to how these development trends influence each other and influence our politics and sense of what's possible. To sum up, in 2001, for the intersecting reasons outlined above, we asked: Can an increasingly diverse nation hope to deal with growing economic inequality if the dominant growth model "on the ground" is one of persistent segregation by race and income? Do the parts of that equation add up? By comparison, the framing paper for this year's symposium centers more squarely on the growth of inequality and the much greater political and even cultural salience of the issue now versus 15 or so years ago. That salience is encouraging. In terms of local trends, the American media and the public are even more aware now, than after the economic boom of the late 1990s, that "cities are back." Major cities that still showed substantial decline a decade ago—New Orleans and large sections of Detroit, for example—have seen their population trends reverse and have attracted enormous investment since, especially over the course of the recovery from the Great Recession. Housing prices are up, structurally, along with the job economy in those and other revitalizing cities. So, a debate about the drivers of segregation and responses to it today appropriately gives greater weight, than did earlier discussions, to urban redevelopment—and the need for "development without displacement," as advocates in revitalizing cities frame the need. The sense of displacement, of being pushed out, is much sharper now than in 2001. But in point of fact, the pattern is nothing new, and some observers forecast this predicament long ago, linking it to the forces driving urban vitality after decades of decline. For example, in Dual City: Restructuring New York, John H. Mollenkopf and Manuel Castells showed that New York's comeback from the low point of the bankruptcy crisis of the 1970s had made the city a global magnet for investment capital and high-income occupations, sharply inflating land values and housing prices. Over the 1980s, they reported, poverty had been pushed outward, "like a ring donut," from neighborhoods in the city's core to its outer boroughs as well as its more racially diverse, fiscally vulnerable inner suburbs. The subsequent decades have merely sustained and accelerated those trends, with New York City showing itself one of the canaries in the coal mine. What Detroit and other cities are seeing and debating now, New York, Boston and other "comeback cities" experienced a couple of decades earlier. And it is structural, not an artifact of one business cycle or another. These trends were barely interrupted by the Great Recession. Finally, having thus far emphasized those durable, long-run structural trends, I want to acknowledge more recent developments. In addition to the growth of inequality, the framing and other papers in this year's symposium reflect the enormous impacts of the foreclosure crisis, which we had only dimly foreshadowed in the 2005 book's chapter on "The Dual Mortgage Market: The Persistence of Discrimination in Mortgage Lending," by William Apgar and Allegra Calder. Beyond a huge loss of housing wealth and greater regulation in the mortgage market, there is another important legacy of the crisis, and it is a healthy one: We are much more conscious now, than in the real estate boom of the early 2000s, about how profoundly the workings of the real estate industry, and its rapid evolution thanks to information technology, can hurt us. In that vein, one of the most ground-breaking sessions in this year's JCHS symposium focused on the present and future of housing searches in an era of platform apps, algorithms, and technology-mediated screening of many kinds. The session put housing scholars in direct exchange with senior analysts and strategists from online real estate search companies that dominate the housing marketplace. Housing searches were different, and our understanding of them much more limited, 15 years ago. If the unequal housing marketplace has evolved—dramatically in some ways—over the past 15 plus years, our sense of the best-available levers for changing segregation has not. Nor has our story about why acting on segregation is both legitimate and urgent, both big and structural and doable and achievable. To be fair, by some measures, our prescriptions today are not all that different from those championed by the "open housing" movement—the inheritors of the civil rights movement and the Kerner Commission warnings—in the early 1970s. This suggests at least three lessons over the long run. The third lesson over the long run is that beyond lacking a compelling story to motivate change, we sometimes lack perspective as well. Take the persistent tendency to conflate discrimination, which the framing paper emphasizes, with segregation. People in America continue to experience housing discrimination, which is illegal, and continue to under-report it. As we analyzed in detail in the 2005 book, such discrimination, while inconsistent with public opinion in America, is challenging to detect and enforce against. But the larger and less acknowledged point was and is this: discrimination, whether conscious or unconscious, against particular kinds of consumers is far less important, as a driver of segregation, than is the avoidance of certain neighborhoods or localities by those with the best housing options, especially whites and higher skill, higher income people of color. This "self-steering" behavior has big social and fiscal costs, as scholars of segregation have pointed out for nearly half a century now. But it is not illegal. Moreover, as sociologist Camille Charles argued in her 2005 chapter on attitudes toward the racial make-up of neighborhoods, many of us balance what we think we owe our families with what we think might contribute, however modestly, to a fairer and more just society. And many of us experience these values as frequently in conflict, especially when faced with decision to move somewhere. Finally, as the framing paper demonstrates, the Joint Center's 2017 symposium encompasses an extraordinarily rich and in-depth update of what I think of as the four enduring debates about segregation: the what (the descriptive patterns or shape of the problem), the why (causes), the so what (consequences), and the now what (solutions). And thanks to big data, mobile broadband, a more visible inequality debate, and other developments, it offers a very contemporary take on what's possible, in theory, when it comes to change. In the language of our 2005 redux, the solutions boil down to "curing" segregation (changing stubborn housing patterns) or "mitigating" it (making the patterns less socially costly, by shifting the relationship between where you live and the risks and resources you encounter). The former centers on relocation and inclusionary development strategies, the latter on reinvestment, connectivity, and access to institutions—sometimes life-changing ones—beyond one's segregated neighborhood. This body of work and those solutions deserve an equally serious and committed story—a resonant narrative—joined to an advocacy and constituency building effort that's relevant in a changing, polarized, deeply unsettled American body politic. Without that, we seem consigned, in practice, to continue rediscovering segregation and also to continue lamenting that it is just too hard—or worse yet, un-American—to undo.